This surname has by far the most variations in spelling of any that I have found. The earliest records in Hambach include these spellings: Visung, Vihsung, Vichung, Wiesong, Wison, Husung and Husong. 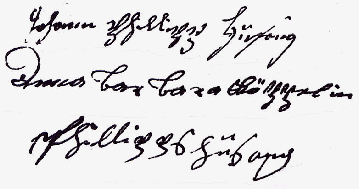 Other Hambach records show the spellings Huison, Hussong and Husong. Once the family arrived in South Russia we find: Hilong (probably a misspelling),Hiesong, Hissong, Hissung, and Hison. This certainly goes to show that one cannot be tied to a particular spelling! Johann Philipp Hussong (born 1750) and his brother Johann Nikolaus (born 1752) migrated to Tschwerwenka, in the Batschka region of Hungary, in 1785. According to the book Tscherwenkaer Familien by Angela Hefner, the first list of the town’s inhabitants is from 14 July 1790. It shows 351 households of farmers and 74 households of craftsmen or day-laborers. One of the four men to undersign this list was Philipp Hussong, Geschworener (juror). Philipp’s widow (Witwe Hussong) appears on an 1802 Liquidations list (for repayment of settlers’ loans). According to this list, she was living at house #30. This would mean that she lived a little more than half way up Oberen Gasse on the Winterseite (apparently opposite sides of the street were designated Winterseite and Sommerseite). Life was not necessarily easier for the colonists in Tscherwenka. Their first spring in 1786 brought very heavy rains which undermined the foundations of many homes, causing 33 to collapse and 100 more to be uninhabitable. Rebuilding took time as many building materials had to be brought in from other areas. Wood was especially scarce as there were no forests in the Batschka area. Their Leaseholders increased their rent in 1790 and settlers were also expected to provide a certain number of days of free labour. Bad weather in some years led to crop failure. A new burden came in 1802 when new taxes were added for the building of a canal between the Theiss and Danube rivers. Many people in Tscherwenka began to look to South Russia as a more promising land. Johann Philipp’s two sons, Johann Nikolaus (born 1781) and Johann Peter (born 1779) emigrated to South Russia in 1805. It is this Johann Nikolaus from whom we are descended. His wife Margaretha’s surname is not mentioned in any available records. Also, it is not known what became of Johann Peter. All of the Hussong ancestors were from the northern Elsass region, now part of Bas-Rhin, France. Johann Philipp was born and married in the village of Hambach, but until his emigration to Hungary he lived and had children in his wife’s village of Puberg. Their ancestors were also from the nearby villages of Busweiler/Weislingen, Dehlingen, Bockenheim, Petersbach, Lützelstein, Vinstingen and Ratzweiler. Their occupations included weaver or linen weaver, stonemason and stonecutter, pig herder, church censor, saddler, tailor, innkeeper, craftsman, carpenter, shoemaker, glassmaker, egg man, tanner, and wagon maker. There were also some appointed village mayors and a lay member of the court. These ancestral villages are in an area known as L’Alsace Bossue or Krummes Elsass—the hilly Alsace. It is composed of the former counties of Nassau-Saarwerden and La Petite Pierre and the former seigniory (noble dominion) of Diemeringen. It is a rural area near the Vosges Mountains and has many orchards and shaded forests. There are many ruins of old castles in the region. 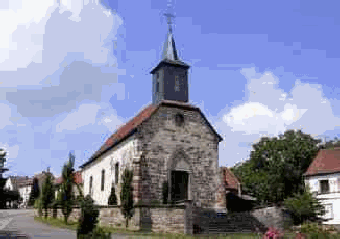 The Lutheran Church was introduced in 1557, but by 1629 the Lorraine Catholics occupied the region and the Protestant pastors were expelled. In 1698 the counts of Nassau-Saarwerden again took control and Lutheran became the official religion, lasting until the French annexation in 1793. There was quite a concern with witchcraft in this area in the late 1600s. One source states that there were several lawsuits for sorcery in the seigniory between 1670-1673, leading to the execution of a dozen inhabitants. Included in Gerhard Hein’s records for Diemeringen is a document discussing proceedings in a witch’s court in 1673. On 16 October 1673 six women from Dehlingen and Diemeringen were executed by sword (beheaded) and burned at the gallows for witchcraft. One of these women was our ancestor, Margaretha, wife of Anstet Hemmert. Another was the first wife, Walpurgis, of our ancestor Johannes/Hans Köppel. The village of Hambach was known as Haganbach in 713, became known as Hambach in 1571, and was renamed Waldhambach in 1891. In 1568 there were 56 families living in Hambach. Its population in 1792 was 630 and in 1999 it was 693. 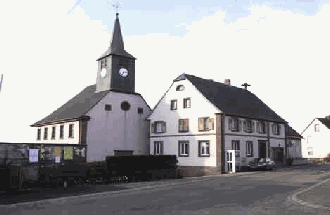 Busweiler, also known as Weislingen and now called Buswiller, had a population of 205 in 1792 and 189 in 1990. Petersbach had 465 residents in 1792 and 725 in 1990. 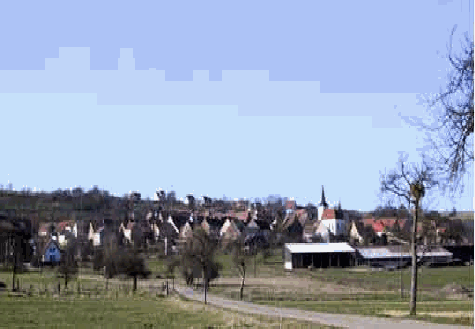 Ratzweiler, a village of 2155 acres, was called Ratrammesvilare in 861. Its population went from 220 in 1794, to 403 in 1851, and back down to 277 in 199. These villages were predominantly Lutheran in 1807. Bockenheim, originally known as Bouquenom, is a very old medieval town on the right bank of the Saar River. It passed from Roman to Alemanni (a Germanic tribe) to Frank rulers. Eventually it came under the rule of the count of Nassau-Saarbrucken in 1554, when it became Lutheran. In 1629 the duke Francois of Lorraine took possession of the city and restored the Catholic religion. The area was devastated by the Thirty Years War. It came under French rule in 1766. On 16 June 1794 Bockenheim was joined with Neusaarwerden, a town on the left bank of the Saar, to form the city of Saarunion (Sarre-Union in French). This town of about 3800 acres had a population of 2,577 in 1794 and 3,408 in 1999. 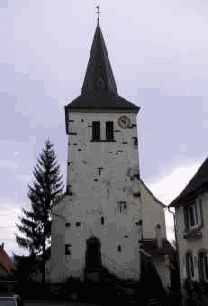 The village of Puberg was known as Boukbert in 1084 and as Buchberg in 1382. In 1314 the area was devastated by the troops of Strasbourg in a war with Nicolas of La Petite Pierre. Subsequently, the inhabitants of Speckweiler and Alt Puberg created a new village on the current site of Puberg. In 1792 it had a population of 216 and 348 people in 1999. Dehlingen was first mentioned in 737 following a donation in favor of the abbey of Wissembourg. It was originally called Diluquifiguia. In 1212 it took the name Dahlingen and by 1361 was called Dehlingen. It had a population of 440 in 1776, grew to 824 inhabitants in 1831, and then dropped to 390 in 1999. The village is located on the side of a hill at the edge of the small valley of Eichel. Lützelstein, meaning "small stone", is now known as La Petite-Pierre. Its location connects the areas of Alsace and Lorraine and the Romans set up a defensive manor house there. It was first mentioned in the second half of the twelfth century, when it consisted of a castle, a tower and other buildings. 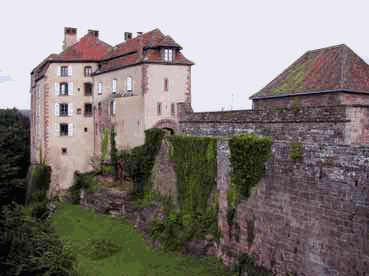 The castle became the residential and administrative center of the counts of Lützelstein and was protected by the steep slopes in the area and by the walls of the strengthened city. During the Thirty Years War, endless troops passed through, and those of the Imperial, Swedish and French armies established quarters there. The city came under the French rule of Louis XIV in 1681. La Petite-Pierre had a population of 615 in 1999.